Sarah is home from college for the summer and working on her swing to prepare for summer tournaments. Sarah had a tendency to not hinge the wrists quite enough on the backswing causing her to release the club too early. This move was limiting her potential for more distance with the driver and not allowing her to compress the ball with her irons. Swinging the Orange Whip, which is a flexible and weighted training aid, helped her increase wrist hinge and over time will help her develop more clubhead speed. In addition, we put the weighted Power Sleeve on her 9 iron and this added weight helped her accomplish the same items as above. The great thing about the Power Sleeve is you can actually hit balls while using the training aid. Both of these should be used daily for maximum benefit. There is a similar training aid as the Orange Whip and it is called the Gold Flex. Both the Gold Flex and Power Sleeve are available at SKLZ.com. Mike was not loading entirely into his right side due to swinging a bit too fast going back. This was causing him to reverse pivot and then slide ahead of the ball on the downswing. The result was his misses going to the right of target. The best way to get him to slow down was to have him stop at the top of his backswing and pause for a count of...one thousand one...one thousand two, then give it a little pump and finish the swing. We had to make sure he was in a great position at the top of his swing and he accomplished that. Note how he is fully coiled into his right side and ready to deliver a solid swing to the finish. After the two count pause we went to a one count pause and then had him feel there was just a slight pause in his normal swing. 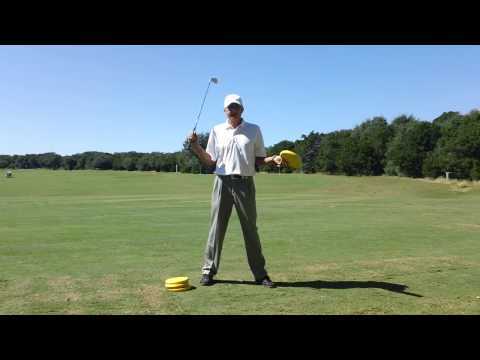 Give it a try, this drill works for many swing issues. If you tend to release the club early in the downswing you are costing yourself distance and accuracy. The symptoms of an early release could include the following shot patterns: high ball flight, thin or fat shots and generally unsolid iron shots. If you look at the top players in their downswing, they maintain close to a 90 degree angle between the hands and the golf club as the hands approach the right thigh. If you cast your hands from the top of the swing you will not achieve that same angle. 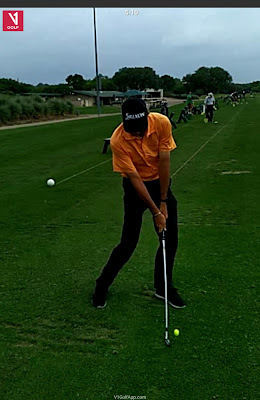 My experience has shown that players with very long backswings have a tendency to release the hands too early. It's much easier to retain the angle with a more compact backswing. In the picture below, my student (left) is demonstrating an early release. His ID is hidden to protect the guilty. 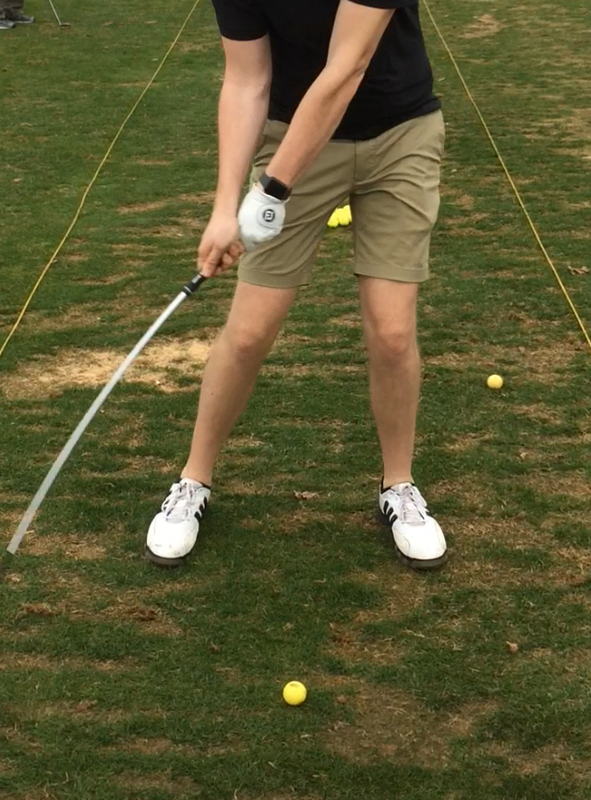 Note how the left arm and club are in alignment prior to impact. Compared to my picture (right) our hands are in the same location but our shaft angle is substantially different. 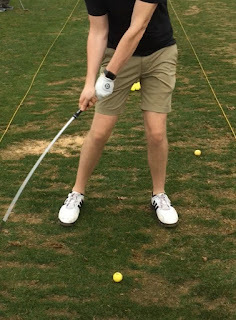 At impact is when our left arm and shaft should be in alignment! I recommend the Pump Drill in the video below to enhance the correct feel of developing lag in the downswing which produces a strong impact position. Perform the drill without a golf ball first just to get the feel of retaining the referenced angle. Make sure you don't overdo the pump, but take about a 3/4 backswing and then let the hands approach the right thigh while maintaining the angle between the hands and club. After a few reps without a ball, go ahead try hitting balls while performing the drill using a short iron such as an 8 or 9 iron. 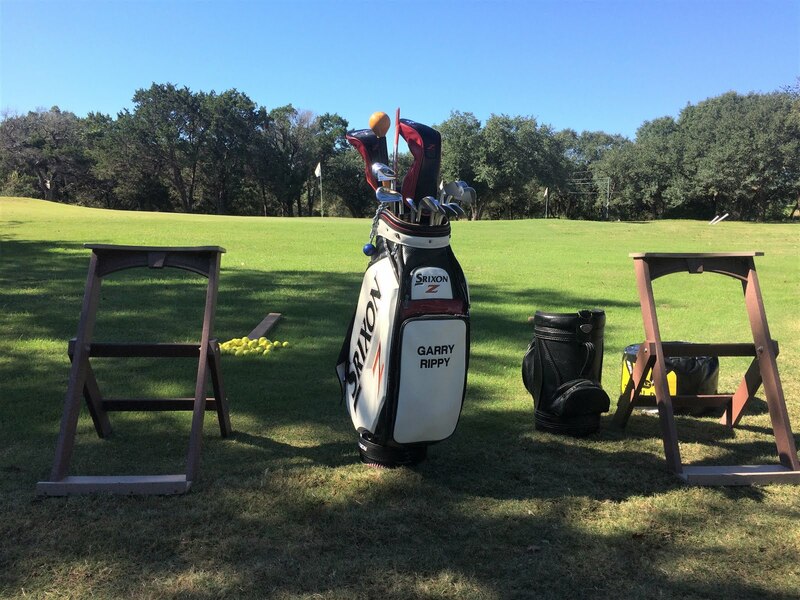 Your ball striking may not be great at first but with a little practice the drill will produce good shots. Be sure and video yourself and see if you making the change. You are now ready to hit balls with your normal swing. You should sense your left hand (right handers) is leading the way on the downswing.